Rousing applause for Dutton and these musicians for this disc of first commercial recordings. A red letter day for these are substantial and very rare Sullivan works. They emerge in good heart under veteran Richard Bonynge's life-ebullient conviction. The singers, solo and ensemble and orchestra deliver fully satisfactory results ... and more. The various proud city festivals reigned supreme in the nineteenth century as the venue for contemporary composers to show off their wares. So it was that in 1864 the Birmingham Festival was the scene of the premiere of 22-year-old Sullivan's Kenilworth masque. Sir Walter Scott was all the rage in Victorian England and it comes as no surprise that Sullivan had a soft spot for his novels and poetry. 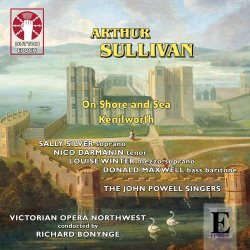 Not only did he write Kenilworth but also the opera Ivanhoe and the concert overture Marmion, each based on Scott. To put things further in context: two years later Sullivan was to write the Irish Symphony and Cello Concerto. Kenilworth is more predictably conventional than On Shore and Sea. It bears the rumbustious rum-ti-tum bounce of the Savoy opera collaborations. Try tracks 12, 14-16 if you are in any doubt: Hark the sound that hails a King, Let fauns the cymbal ring, Slow Dance and I am a Ruler on the Sea. The opening A Summer night sports a long and flowing Mendelssohnian melody. Hark the sound that hails a King incorporates some cries of God Save the Queen! all delivered in a rather plummy Victorian accent. The so-called Slow Dance manages to combine gracious optimism with a gleam and a wink. Sullivan ends the Masque with the smooth, suave and even reverential God Save The Queen! The duet: How sweet the moonlight sleeps (tr.18) is quite magical with woodwind zephyrs at play and the chuckling echoes of Vltava in the foreground. Dutton show their attention to detail and good taste by placing a good long pause between the end of On Shore and Sea and the start of Kenilworth. In 1870 the Birmingham Festival was the setting for the first performance of the Overture di Ballo but it was the 1871 London International Exhibition that had the premiere of On Shore and Sea. It was a fateful year: for it also saw a collaboration with Gilbert in the stage-work Thespis and the writing of his most widely-heard work, the hymn Onward Christian Soldiers, to words by Sabine Baring-Gould. Frankly, On Shore and Sea surprised and delighted me even after allowing for its hokum Christians-against-Moslems 'plot'. It clearly grew from the same winningly innocent mulch as Raff's Tageszeiten and Brahms’ Volkslieder. In it Sullivan is caught at his most fluently mellifluous. There's variety too. Along the way we encounter, in the hoarse and breathy From Springtime on to Summer, the bass drum delivering some imposingly thudded cannon shots. Moresque Dance and Moslem Triumph issue an invitation to the swaying Orient; this complete with jingling Alla Turca percussion and 'barbaric' North African atmosphere. This music presents Sullivan in another light - the peddler of the light exotic - where he is in good company with Massenet and Godard. We are also treated to the English equivalent of Borodin's Polovtsian Dances. The music is not short of melodrama and in the Handelian Sink and Scatter final chorus there's regal atmosphere as well. Golden assertive horns rise out of the texture to put the seal on all that jolly ebullience. The full sung texts can be found here. The booklet comprises worthwhile essays by Martin Wright and Robin Gordon-Powell. This is Dutton's first immersion in Sullivan. What we hear is very enjoyable and well recorded. It is bound to please the Sullivan legions and others wanting to explore this composer's contribution to the Victorian era secular cantata.